You can now include params in the url and redirect to Freshdesk new ticket page. The params can be fetched and used to look up for specific information in an external system and populate them in the ticket page. When agents with restricted group access try to create a new ticket/send a response on a ticket, they will be able to access only the support email addresses that belong to the groups that they're part of. Agents can now easily share an article from the article page by using this option. The link to the article on the customer portal will be copied to the clipboard. It wasn't possible to update a ticket when the ticket subject was empty. It resulted in a payload error and forced you to switch back to the old UI to close/update these tickets. We've fixed the bug and you don't have to switch back and forth anymore! Clicking on 'View all' option in any company page, resulting in an error "Customer segmentation doesn't exist. Loading all contacts". Fixed now! The survey responses managed to stay afloat even if the contacts were deleted. We've handled this case and they no longer stay in your helpdesk when you delete a contact. Solutions/ Forums didn't load as expected on IE11. This browser compatibility issue has been squashed now. 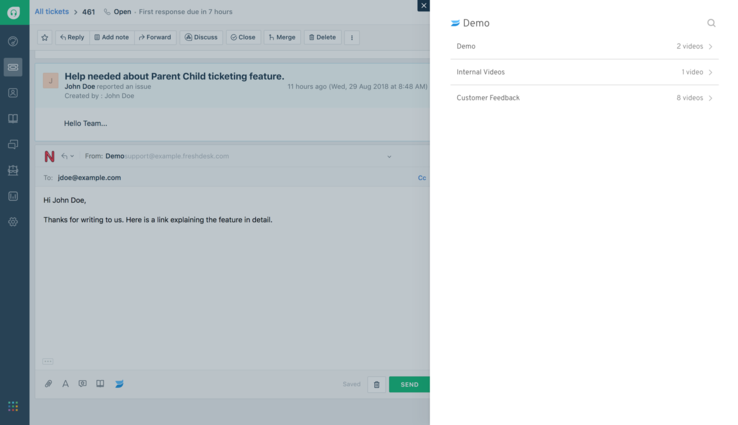 On accounts that had multiple products enabled and the product field mandatory to close tickets, trying to bulk update tickets from the list view resulted in an error. Fixed now. Wistia Integration: Add your Wistia videos in tickets by the click of a button! Works only with the Mint interface.